THE GRANT FAMILY PEW sits in the United Methodist Church of Galena, Illinois, testifying to the religious roots of Ulysses S. Grant. Finding evidence of faith in the general’s adult life is harder. At West Point, Grant (1822–1885) complained that the academy tried to mold cadets into gentlemanly Episcopalians. He resisted. Grant’s wife, Julie, was a devout Methodist. Throughout their marriage it rankled her that her husband never became a churchgoer. He claimed he didn’t like the music. Grant became known for intemperate drinking. The allegations were partially true: he drank too much when he was depressed or away from Julie. Though passed over by the War Department at the outbreak of the Civil War, Grant eventually rose to the occasion of his life. Regarded by history as a great general, he went on to serve two terms as president. Grant liked to say he was a verb and not a pronoun. When Lee surrendered to him at Appomattox, he let Lee’s “men who claim to own a horse or mule . . . take the animals home to work their little farms.” He also sent rations to Lee’s starving men. On his deathbed, after a long battle with throat cancer, Grant was rebaptized at the insistence of his friends. 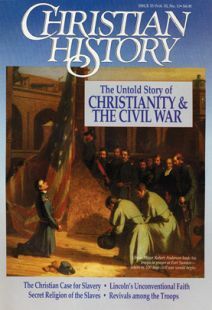 More resources on Christianity and the Civil War.